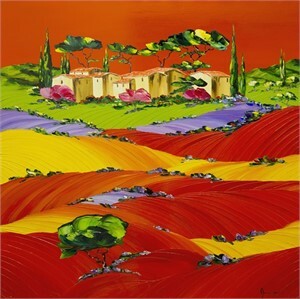 Monika Meunier was born on the Mediterranean Coast in May 1947. At the age of two, her family relocated to Paris (France), where Meunier was raised. Growing up, her close family provided her with artistic inspiration seeing that she had aunts and uncles who hailed as musicians, painters and photographers. By studying their works, Meunier was able to discover how to compose deep meaningful paintings that capture nature's true essence. In 1957, she and her family settled in Nice, a city located on the French Riviera. Meunier did not enjoy the typical schooling she was receiving so, at the age of 16, she enrolled in "Les Beaux-Arts" of Nice where she further honed her artistic talents. After completing her schooling she traveled world-wide, living in the United States (Miami Beach, Florida and Houston, Texas) and Germany (Stuttgart). These cities provided inspiration which led her to experiment in various forms of expressions – greatly enriching her appreciation of art. Meunier expanded her talents into drawing, sculpture, stained glass, antique restoration, etching but her focus remained on painting. Meunier is particularly inspired by the surrealistic works of Salvador Dalí. In 1992, Meunier created the Nice Art Association for French painters and held exhibitions involving hundreds of painters in the 1990s. 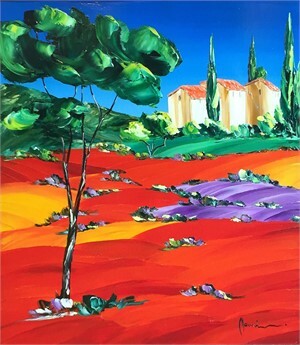 After working with such talented artists, she decided to immerse herself in the artistic adventure and opened her studio in Nice. Meunier's works present collectors with idealized versions of the beautiful region which surrounds her studio. Towering amid cypress and olive trees, are the local sights that inspire her constantly. She brings her landscapes to life with scenes - the sun is always shining and the flowers always in bloom. 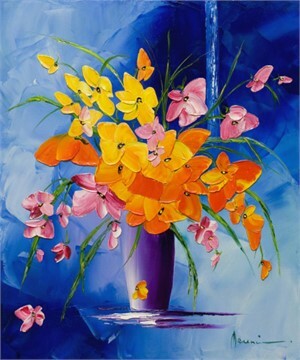 Meunier uses only oil paints and carefully applies them to the canvas with her palette knife. 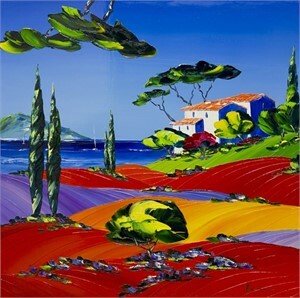 She has a distinctive style that presents landscapes in sweeping texture and vibrant colors – rich red earth, the bright violet lavender fields and the calming blue coastal waters. 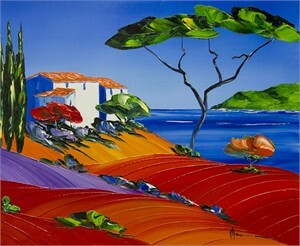 Monika Meunier was born on the Mediterranean Coast in May 1947. At the age of two, her family relocated to Paris (France), where Meunier was raised. Growing up, her close family provided her with artistic inspiration seeing that she had aunts and uncles who hailed as musicians, painters and photographers. By studying their works, Meunier was able to discover how to compose deep meaningful paintings that capture nature's true essence. In 1957, she and her family settled in Nice, a city located on the French Riviera. Meunier did not enjoy the typical schooling she was receiving so, at the age of 16, she enrolled in "Les Beaux-Arts" of Nice where she further honed her artistic talents. After completing her schooling she traveled world-wide, living in the United States (Miami Beach, Florida and Houston, Texas) and Germany (Stuttgart). These cities provided inspiration which led her to experiment in various forms of expressions – greatly enriching her appreciation of art. Meunier expanded her talents into drawing, sculpture, stained glass, antique restoration, etching but her focus remained on painting. Meunier is particularly inspired by the surrealistic works of Salvador Dalí. In 1992, Meunier created the Nice Art Association for French painters and held exhibitions involving hundreds of painters in the 1990s. After working with such talented artists, she decided to immerse herself in the artistic adventure and opened her studio in Nice. Meunier's works present collectors with idealized versions of the beautiful region which surrounds her studio. Towering amid cypress and olive trees, are the local sights that inspire her constantly. She brings her landscapes to life with scenes - the sun is always shining and the flowers always in bloom. 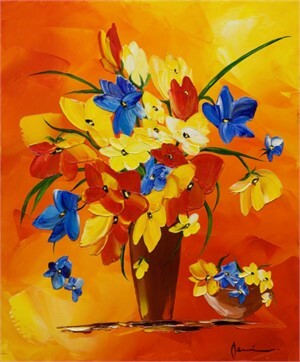 Meunier uses only oil paints and carefully applies them to the canvas with her palette knife. 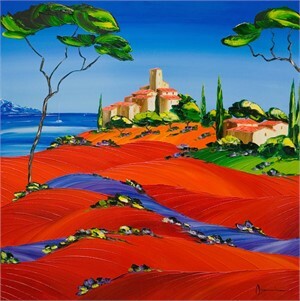 She has a distinctive style that presents landscapes in sweeping texture and vibrant colors – rich red earth, the bright violet lavender fields and the calming blue coastal waters.